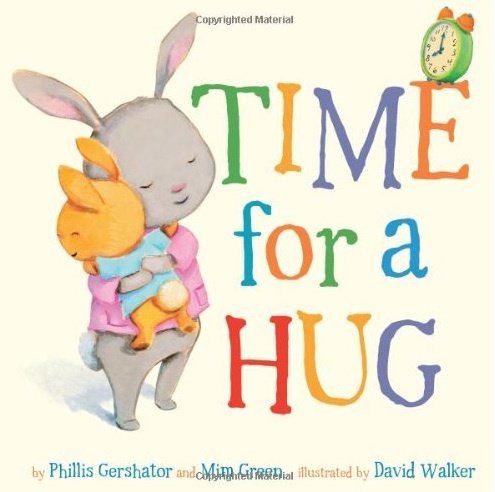 Time for a Hug (Snuggle Time Stories) is a sweet little board book by Phillis Gershator and Mim Green. Following the course of a day, there is always time for a hug. When is it time for a hug? Anytime! This feel-good picture book assures kids there’s plenty of love to go around-the-clock. From the moment Little Bunny wakes up in the morning until the moon comes out and the stars shine, every hour includes a warm hug from Big Bunny. Whether they bake or build, bike or hike, a caring hug always feels just right. This is a book that is generous with love, and full of the sweetest illustrations you’ve ever seen. I agree this is a sweet book, but unfortunately there is nothing eco-friendly about it. It is made of your typical plastic coated board book pages, which have always concerned me. Board books are made from heavy cardboard with a plastic coating. The pages are easy for very young children to turn. Board books are sturdy and can stand hard wear by babies, who tend to throw them, crawl over them, and chew them. Board books can be wiped clean. Many of my children’s favorite board books had teeth marks and corners chewed off from our teething days. I thought nothing as a new mom to pass my child a board book in the car and let him/her gnaw away at it. Now I wonder, what exactly is in that plastic coating? Board books are sturdy and easy to clean because of the plastic coating, but I do wonder about it’s safety and necessity. I don’t think a board book can be eco-friendly if it has this coating.